The pocket-size T3 isn't just for PCs. Samsung is coming out with a new portable solid-state drive that’s not meant only for PCs: it will also plug into smartphones and tablets that support USB-C connections. The new pocket-sized SSD T3 provides a speed and capacity boost over the USB-C thumb drives, which work on mobile devices but are not full-fledged SSDs. The SSD T3 will be available in capacities up to 2TB and start shipping next month. The drive will be compatible with Windows, Mac OS, and Android 4.4 and higher. 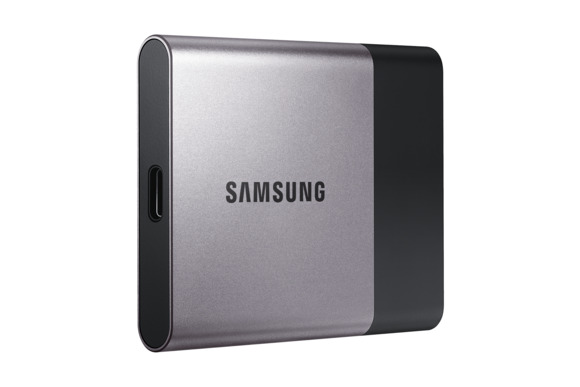 Samsung hasn’t said what the SSD T3 will cost, but it succeeds the SSD T1 drive, which shipped a year ago and was priced at $180 for a 250GB drive and $600 for a 1TB drive. The drive weighs 55 grams and can just fit into a shirt pocket, making it an easy accessory to carry along with a mobile device. 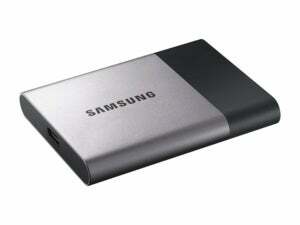 It is based on Samsung’s latest V-NAND technology, in which dense storage chips are layered on top of each other. The drive does not have a conventional USB-sized port, so users of most current-generation PCs will need a dongle to connect to a larger USB 3.0 port. The USB-C port helps reduce the size of the drive. The earlier T1 drives had a slightly larger micro-USB 3.0 port, which didn’t become popular in mobile devices. The T3’s USB-C port is based on the USB 3.1 protocol, which can transfer data between host devices and peripherals at up to 10Gbps (bits per second). Samsung says the T3 has sequential read and write speeds of up to 450MB per second.